Get beautiful new siding for your home today! 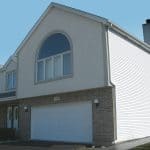 Home Improvements USA specializes in Seamless Siding. Seamless Siding is made of a heavy gauge aluminum alloy. Most homes that have boxed siding installed have unsightly seams and gaps from the overlapping of the siding. These seams and gaps can allow dirt and moisture to enter in behind the siding. Seamless Siding panels are custom made to fit the exact length of your home therefore eliminating seams and gaps. The elimination of seams and gaps provides a smooth finish to the outside of your home. Conventional box siding panels are prone to sagging and rippling. Some vinyl siding will crack and warp due to hot and cold temperatures. 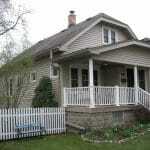 Seamless Siding is durable and warp resistant. Home Improvements USA always uses a foam board insulation that provides the best energy savings. 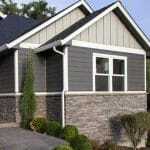 Home Improvements USA offers five custom styles of siding and 30 colors for you to choose from. Best of all Home Improvements USA offers a Lifetime guarantee on siding material and labor. AN AVERAGE HOME WITH VINYL SIDING HAS 137 SEAMS. THAT’S POTENTIALLY 137 PROBLEMS. horrible, especially after a few years of fading and collection of dirt and moisture in the seams. environment. The long term effect was the siding faded and had a chalk like texture on the surface. Vinyl siding buckles, waves, & cracks. Common problems with seams include drooping and buckling panels. Vinyl siding expands and contracts so it has to be nailed loose. Gaps have to be left at the ends. On a hot day, you can hear the panels moving. Sometimes the seams pull apart causing issues with moisture getting in and costing money in heating and cooling costs. The finish can fade to a point to where it is hard to determine the original color. Seamless siding eliminates 137 potential problems. There are no unsightly seams on the home, drooping panels, and areas for moisture and dirt to accumulate. The panels are very thick .025 aluminum alloy and hail resistant. Darker colors, an option unthinkable with vinyl due to fading issues, are available in a finish that doesn’t react with the outside elements and maintains its color for the life of the home. Seamless Siding panels are custom made to fit the exact length of your home, therefore, eliminating seams and gaps. The elimination of seams and gaps provides a smooth finish to the outside of your home. Conventional box siding panels are prone to sagging and rippling. Some vinyl siding will crack and warp due to hot and cold temperatures. for moisture and dirt to accumulate. The panels are very thick .025 aluminum alloy and hail resistant. Darker colors, an option unthinkable with vinyl due to fading issues, are available in a finish that doesn’t react with the outside elements and maintains its color for the life of the home. Siding	Overall rating:	5	out of 5 based on 1	reviews.